Scotland have been making a big noise about their Sevens squad in recent years. While they may not exactly be high-fliers as far as the IRB World Series goes, last year’s Glasgow Commonwealth games and the annual Murrayfield leg of the IRB Sevens touring circuit means that an effort is always made to ensure that the Scots are nicely turned out in some tasty bespoke Sevens gear. This is often not a good thing. 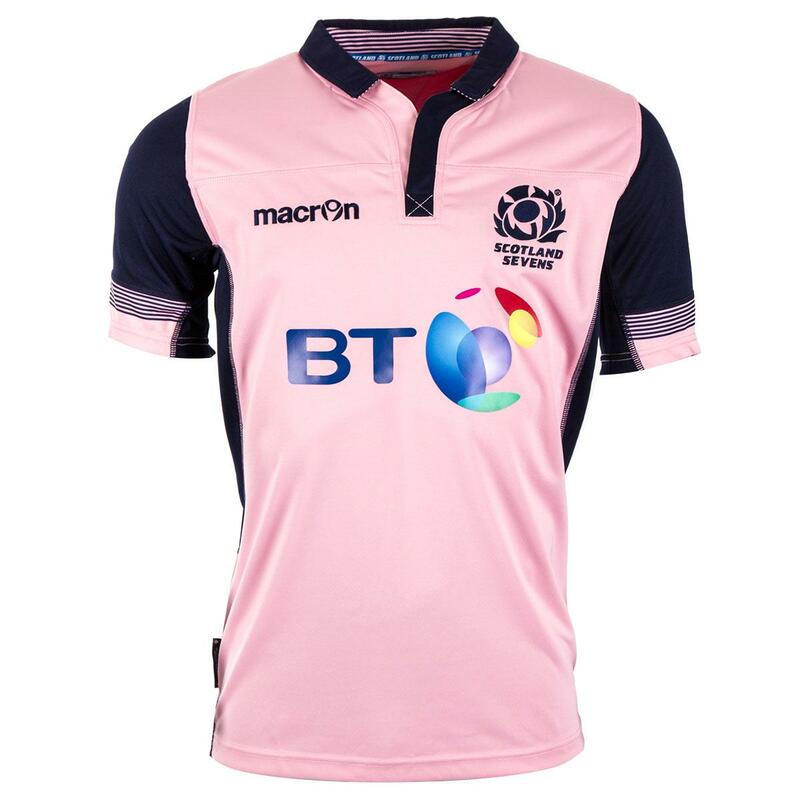 Scotland Sevens have had some true stinkers in recent years, culminating with last season’s hideous purple Leisure Centre Polo Shirt monstrosities. Thankfully though, things are a damn sight more tasteful this time around, as you can see. Yes, before you say anything, we know that there’s an elephant in the room here, but honestly, we’re all comfortable enough in our respective sexualities to not complain about a few dashes of pale pink, aren’t we? 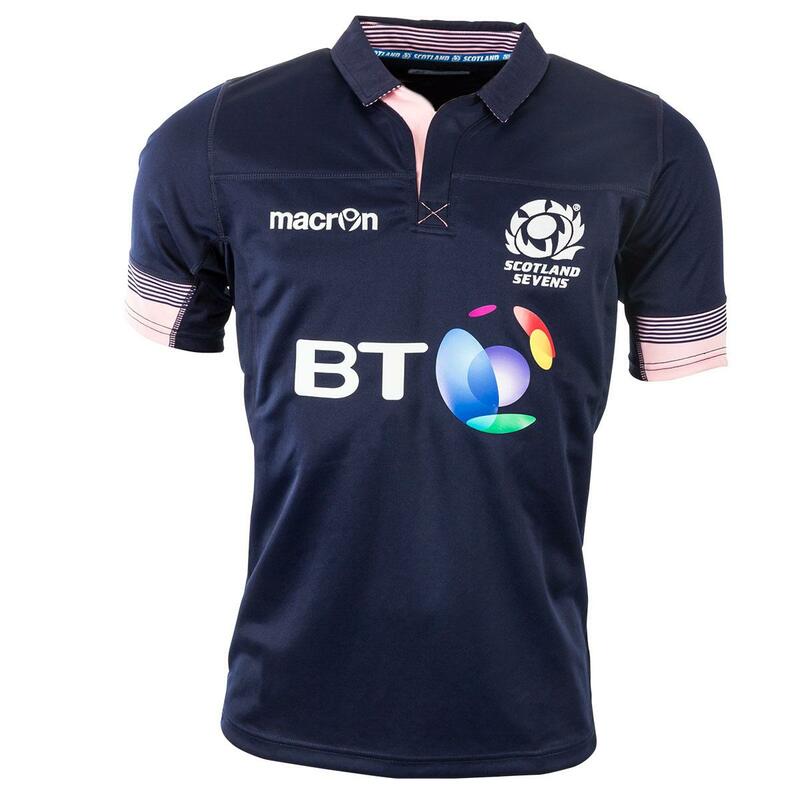 We think it works really well with the (mercifully returning) dark blue, and the simplicity of the two-tone design is really lovely when combined with the basic template of the heroically classic Scotland home shirt, it’s quite a thing of beauty. If we were to be picky, we’d moan that the multi-coloured globe thing on the BT logo is a bit tacky and ruins things as it always does, but it’s a minor quibble. The alternate shirt is, admittedly, a bit of a tougher sell. We’re not sure we’d walk the streets wearing this, but we still think it’s pretty nice. If anything, we don’t like the blue sleeves – a simple palette swap would have looked a bit less odd, but we can understand why the designers wanted to give the blue more emphasis here. Sadly that bloody BT logo looks even worse on the pink here, and all in all, we don’t think the design works quite as well as the home. That said, these are two interesting and cool designs that certainly improve over last year’s dogshit dinner. Very Eden Park, too.